Here’s where an alphabetical listing of Pioneers will grow. Articles will be linked to essays about associated claims, mines and enterprises featured elsewhere at the site. Walter Glenn Macomber, inventor of the Macomber Rotary Engine and resident of the Rand region from 1899-1909, was born at Battle Creek, Michigan on June 30, 1871, the son of Zebedee Macomber and Clara (Wright) Macomber. He was educated in the public schools of Bedford, Michigan and by private tutors. He married Mabel Godsmark on June 14, 1894 at Bedford, and the couple had one daughter, Ina L. Macomber, born April 23, 1895. According to the Press Reference Library, Southwest Edition (published by the Los Angeles Examiner, 1912): “Macomber comes by his inventive genius naturally, his father before him having been a practical engineer who contributed largely to the origination of the first traction engine.” As a teenager, Macomber constructed a miniature steam engine and a self-inking printing press. During his early 20s, he worked as a professional photographer. He then studied mechanical engineering privately and qualified in that profession. Through his wife’s uncles, W. W. Godsmark and Alfred Godsmark, Macomber had an opportunity to move to California in 1899, where he lived in Johannesburg and worked as an engineer for the Croesus Mining Company. W. W. Godsmark was a director of the Croesus Mining Company (Sacramento Record-Union, Dec. 5, 1899), which purchased the Pinmore gold mine. W. W. Godsmark was also part owner of the Johannesburg Hotel (Randsburg Miner, Sept. 1900). Alfred Godsmark was a principal in the firm of Godsmark, Durand & Co., a leading wholesale grocery in southwest Michigan. 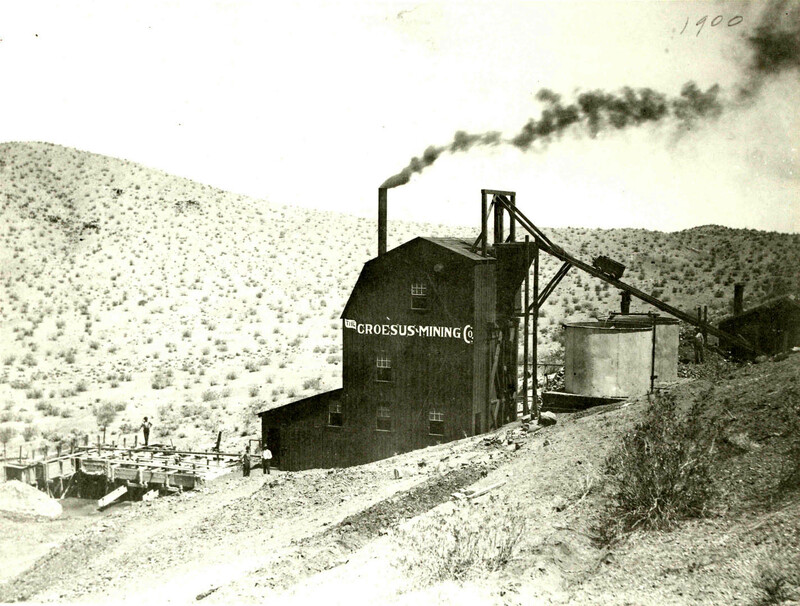 The Godsmark brothers invested in gold mines and other businesses in the Rand and Panamint districts in the late 1800s and early 1900s. They led a group of Michigan investors who purchased the Never Give Up mine from Henry Ratcliff in September 1898, forming a closed corporation, the Ratcliff Consolidated Gold Mines, Ltd. By January 1900, the mine was turning out $15,000 a month in gold and was “the new boss mine of the Panamints.” (Death Valley and the Amargosa: A Land of Illusion by Richard E. Lingenfelter). 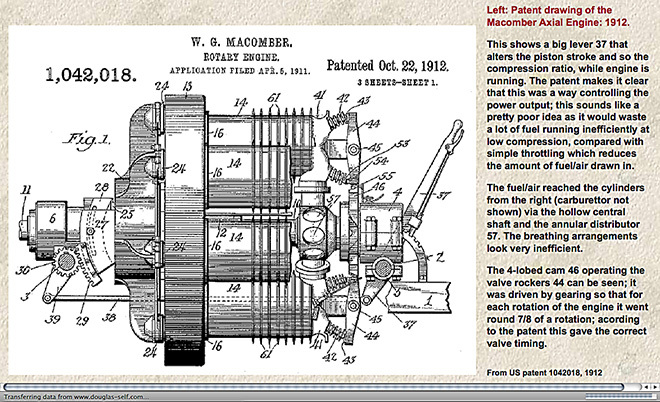 Macomber invented his internal combustion rotary engine while he was employed by the Randsburg Water Company. As reported in the San Francisco Call, he obtained a patent on this invention on September 13, 1909. It became known as the Macomber Rotary. Over the years, he continued to refine this engine and reapply for patents. Macomber moved to Los Angeles in 1909 to pursue opportunities related to the engine. 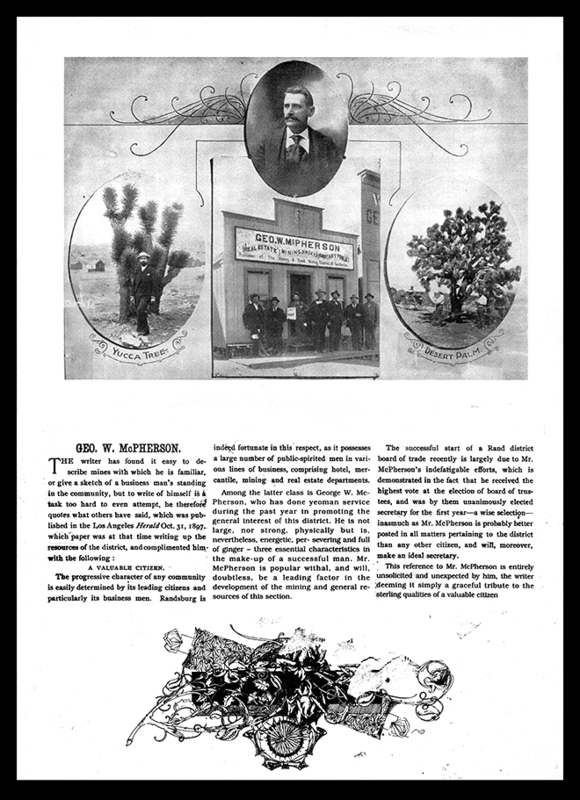 The Los Angeles Herald reported on December 2, 1909, under New Incorporations: “Macomber Rotary Engine Company, capital $1,000,000; directors, W. G. Macomber, George A. Coffey, A. M. Scott, L. A. Montandon, Los Angeles; C. G. Illingworth, Randsburg.” Macomber served as president and general manager. The company’s offices were located at 421-2-3 I. W. Hellman Bldg. in Los Angeles, and the factory or “works” was at 235-7 Aliso St. The Macomber rotary was used in both airplanes and automobiles. It was regarded as a possible solution for the problem of aerial vibration. In May 1911, aviation pioneer Charlie Walsh made a number of successful short flights at Playa del Rey in the “Walsh Silver Dart,” which was equipped with the Macomber rotary. The Eagle Cycle Car Company in Chicago, Illinois contracted for use of the Macomber rotary in cycle cars in 1915. The company changed its name to the Eagle-Macomber Motor Car Co. and established a manufacturing facility in Sandusky, Ohio. A stubby, sturdy-looking yellow car pulled up before 307 West Madison Street, and two browned men stepped out into a welcoming crowd. They were W. G. Macomber, inventor of a rotary engine said to be the last word in automobile “kultur,” and his mechanician, Arthur Lee. They had just finished a cross-country trip of 2,600 miles from Los Angeles, in one of the new Eagle cars, which own the exclusive right to this new Macomber rotary engine. The car pulled through with scarcely any mishap and Macomber made the triumphant declaration of its eighteen-horse power capacity with a 3,000 pound load. Macomber traveled on to Sandusky, Ohio, to assist in further development of the engine. However, large-scale production never came to pass. It appears that the engine was never quite perfected; problems included noise from unmuffled exhaust ports, the lubrication system, and overheating. The exact number of Eagle-Macomber cars and Macomber rotary engines produced remains unknown. After the Eagle-Macomber Motor Car Company was disbanded, Walter Macomber continued to work on the engine at his machine shop in downtown Los Angeles, the Macomber Machine Works. He also worked as a contract tool-and-die maker. Throughout his life, he pursued his interest in photography, producing beautiful hand-colored views taken on his travels around California. He continued to work at his machine shop until his death in April 1947 at the age of 75. He is buried at Forest Lawn, Glendale. The progressive character of any community is easily determined by its leading citizens and particularly its business men. Randsburg is indeed fortunate in this respect, as it possesses a large number of public-spirited men in various lines of business, comprising hotel, mercantile, mining and real estate departments. Among the latter class is George W. McPherson, who has done yeoman service during the past year in promoting the general interest of this district. He is not large, nor strong, physically but is, nevertheless, energetic, per- serving and full of ginger – three essential characteristics in the make-up of a successful man. Mr. McPherson is popular withal, and will, doubtless, be a leading factor in the development of the mining and general resources of this section. The successful start of a Rand district board of trade recently is largely due to Mr. McPherson’s indefatigable efforts, which is demonstrated in the fact that he received the highest vote at the election of board of trustees, and was by them unanimously elected secretary for the first year–a wise selection–inasmuch as Mr. McPherson is probably better posted in all matters pertaining to the district than any other citizen, and will, moreover, make an ideal secretary. This reference to Mr. McPherson is entirely unsolicited and unexpected by him, the writer deeming it simply a graceful tribute to the sterling qualities of a valuable citizen. JUNE 27, 1900: “PATRICK REDDY’s sufferings were relieved by the peaceful hand of death yesterday. He passed quietly away at his residence, 2717 Pacific Avenue, at 6:15 o’clock, surrounded by those dear to him. For the past month he had been confined to his bed by pneumonia and Bright’s disease and his physicians gave little hope for his recovery. Dr. Albert Abrams and Dr. H. C. Sawyer were constantly at his bedside and they did all that science could do to save their patient’s life, but their efforts were unavailing. His advanced age and the ravages of the disease made his recovery impossible. The news of his death will be received with sincere regret by the bench and bar and his innumerable friends. “Pat” Reddy as he was often called by his friends and associates was probably one of the best known and most popular lawyers in the West. He was the senior member of the well-known firm of Ready Campbell & Metson. His rise to prominence in his profession and his position in the community was due wholly to his individual efforts. He was a self-made man in every sense of the term. Deceased was a native of Woonsocket. R. I., where he was born February 15, 1839. His parents were natives of Ireland. He received his education in his native State, and in February. 1861 came to the Pacific Coast and engaged in mining. He subsequently studied law in Inyo County and was admitted to the bar In May, 1867 engaging in the practice of his profession there until April, 1879 when he removed to Bodie. He resided in that famous mining town until 1881, when he opened an office in this city. Mr. Reddy was a member of the constitutional convention, representing Inyo and Mono counties. In 1883 he was elected to the State Senate as the representative of Mono, Inyo, Kern, Tulare and Fresno counties. He looked after the interests of that important district for four years and earned the gratitude of the residents of those counties. He was appointed a member of the Board of State Prison Directors in 1889 but had to resign that position the following year because of his increasing law practice. His business, however, did not prevent him investing in mining enterprises. He became part owner in a number of paying mines and was one of the original owners of the Yellow Aster mine, the famous piece of property which made the reputation of Randsburg. It is understood he sold his interest in the mine for a large sum of money. Mr. Reddy was interested as counsel in some of the most important litigation in the history of this State. As a criminal lawyer his name has been heralded throughout the West for his successes. He won the gratitude of the miners of the Coeur d’Alene district by his efforts in their behalf and his graphic letters to The Call, in which he described the harsh treatment of the miners by the mine owners and the troops, the horrors of the “bullpen” and the moves of the wily politicians of Idaho created widespread comment. Deceased leaves a wife but no children. He was married in Esmeralda County, Nevada, in 1864, to Miss Emma Page, and they have lived a most happy life together. Captain E. A. Reddy, superintendent of the Almshouse, is an only brother. J. C. Campbell and William H. Metson, his law partners, are both out of the city. Mr. Campbell is engaged in the trial of a case at Eureka and Mr. Metson is now in Nome on business for the firm. Both will be immediately notified of their colleague’s death. During the hearing of the contempt case against Federal Quarantine Officer Kinyoun yesterday James G. Maguire announced the death of Hon. Patrick Reddy, and moved that United States Circuit Judge Morrow adjourn the court out of respect to his memory. Mr. Maguire paid a feeling tribute to the worth of the deceased lawyer. Judge Morrow said that the court was entirely in accord with what Mr. Maguire had said in respect to the sterling worth of Mr. Reddy. “He always observed the requirements of the profession in endeavoring to assist the court in arriving at the truth. His death is a great loss to the bar,” said Judge Morrow, and then adjourned court out of respect to the memory of the dead lawyer. The funeral arrangements have not as yet been completed, but it is very probable that the interment will be in Cypress Lawn Cemetery on Friday afternoon. “HE STRUCK IT RICH.” What other calling than mining evokes such an expression in reference to its successful members? If a man accumulates fortune due to mercantile pursuits, he accounted astute; if he attains eminence in the professions, he is robed in brilliancy; if invention yields him fame, he is a genius—it is only the mining man who is the “lucky cuss.” Yet the careers of most of the mining men of California would indicate that ability had quite as much to do with successful mining as luck, and of those who have won wealth and prominence in the Great Southwest few will be found on the fool’s register. John Singleton is not a mere lucky adventurer who quit some other occupation and “struck it rich” by a happy mining accident. He was, and is, a miner, first, last and all the time. When Gen. Lawton was introduced to a shouting crowd, he said with a touch of pathos “I am not a hero, I am only a regular.” John Singleton is only a miner. He is a professional miner, one bred to the vocation; one who entered upon his life work in his youth, and who, after devoting over thirty years of intelligent study and effort to the work, has had ample an gratifying success.. He has not merely achieved great wealth; he has won fame as well, and he will live in our history as the ideal miner. Indeed, he is the pioneer of the typical miner of the future, for, although he did not have the technical education of the mining school to commence with, he was compelled to acquire in the course of his practical development, almost all the scientific knowledge which mining schools now teach, and which is indispensable to the rapid growth of the mining industry. The first generation of miners which overran the mining regions had for its historic figures the heroes of the lucky finds; the new generation will be distinguished by its scientific miners, whose keen knowledge of the geological formations, combined with practical business acumen, will enable them to do what John Singleton did, and find fortunes in rocks that had been prospected in vain by the unscientific for years. A native of Sunny Tennessee, John Singleton began life in 1847. Here he attended the common schools and received his early education, later supplementing it at Eastern institutions of learning. Upon the completion of his education and having reached man’s estate, he accepted a position in a cotton brokerage office of a wealthy uncle in Texas. Here he remained some time, gaining an invaluable general knowledge of business methods, all of which was to prove useful to him in later life. In the fall of ’69 the Union Pacific Railroad was completed, and that and the following year marked one of the greatest mining excitements of the period—the White Pine rush into Nevada. Young Singleton became infused with the fever and joined the throng seeking fortunes in the far West. He did not stop in Nevada, however, but came directly through to California, the State of his adoption, where he became at once actively interested in quartz mining and laid the foundation for the practical experience to which he owes so much of his subsequent success. It is not the purpose to follow his career through the dozen or more camps that claimed his attention previous to his locating the famous bonanza of the Randsburg district, but we may say briefly that his experience was that of hundreds of other Western mining men who have in the course of their experience, made and lost a score of fortunes and brave the dangers of the frontier troubles of that time. The American mining man of moderate resources is a born plunger, and it is through his fearless investment that the mineral wealth of the country has been exploited and opened up; and incidentally, that many individual instances recorded where prominent mining men have found themselves once more at the foot of the ladder. But hope and perseverance are virtues with which the miner has been liberally endowed, and temporary reverses are but milestones in his checkered career. So with Mr. Singleton. He had made and lost considerable sums without attaining the measure of wealth to create in him the spirit of conservatism dominating other fields of enterprise; but his time had been most profitably improved under the tutelage of the greatest of masters – experience — and he was amply equipped for the exercise of sound knowledge in all subsequent demands upon his judgment. Those demands came upon his entry to the Randsburg district. In company with C. A. Burcham and F. M. Mooers, he located the world-renowned Yellow Aster mine on the 23rd day of April, 1895. They commenced work upon the property at once, although under great difficulties, as all the water used had to be hauled over twelve miles to the camp. Mr. Singleton the value of his practical experience by locating over 265 acres of quartz claims and about 100 acres of placer claims. The story of the famous Yellow Aster, the mine which has produced millions in a period of less than eight years, is told elsewhere in this magazine. A wealth of illustrations will speak better than words for the money that has been expended in improving the property. The discovery of the Yellow Aster marked an epoch in the history of mining in Southern California. While mines had been opened in various districts in the southern portion of the State, up to the discovery of the Yellow Aster no bonanza could be boasted of. The immense sums of money that have been expended on the property came from the mine itself, which has, under the judicious management of Mr. Singleton and his partners, become one of the great mines of the State. Labor disturbances in the summer of 1903 seriously retarded for a time, the great mine’s production, but with a steady hand the affairs of the company were guided over the threatening times, and the Yellow Aster is now, and has for many months been worked to its utmost capacity.